The holiday season is underway and I am happy to introduce my newest favorite side dish: Asiago Sweet Potatoes. Oh hello crispy cheesy slightly sweet but mostly savory oniony potatoey deliciousness! In my family, we alternate hosting Thanksgiving and Christmas between my parents/sisters and my aunt/ uncle/cousins. This year Thanksgiving is at my house and I will be home! The brainstorming emails have already begun – Sister1: We should make this recipe? Mama: Or maybe this? Me: OR ALL OF THEM! (Apply that train of logic to all aspects of the meal). Perhaps it’s because I’m late to the potato-party, or maybe because they are objectively weird (a side dish or a dessert? I can’t tell! ), but I don’t think I’ll ever be on board for the traditional marshmallow-y sweet potato casserole. But I do like them! And last weekend I was invited to my first holiday meal of the season: a combination birthday party and pre-Thanksgiving dinner (entitled “Birthsgiving”…don’t overthink it). 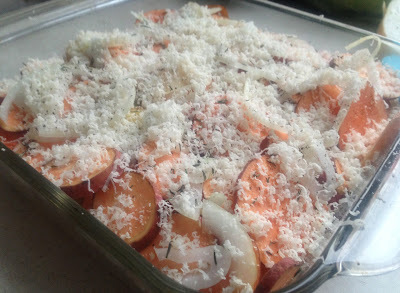 I had a CSA bag full of sweet potatoes and a craving for something cheesy, thus TA-DA! 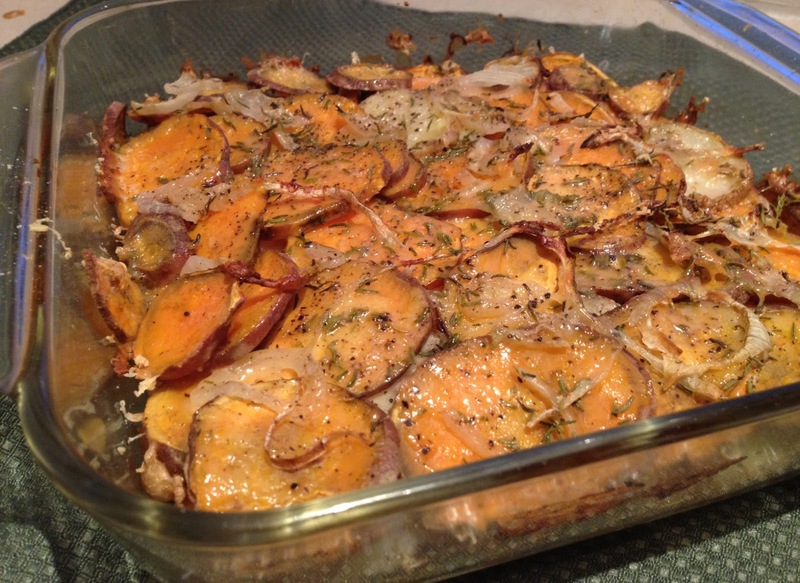 Baked, tin-foiled, and transported – this sweet potatoey situation I concocted is absolutely delicious!!! 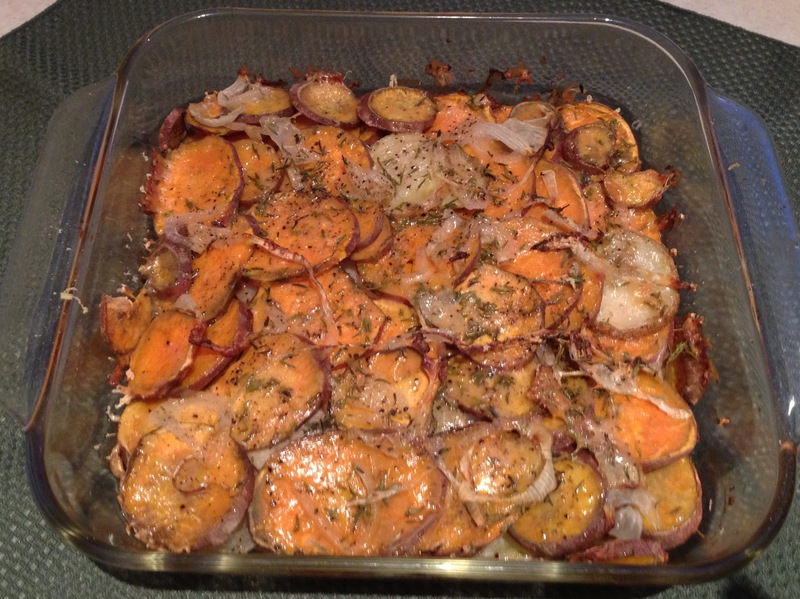 I used my mandolin to evenly slice a mix of sweet potatoes, regular potatoes, and onions. Do as I say and not as I do: WATCH YOUR FINGERS! Since this was supposed to be a veggie side dish, I went pretty light on the cheese. You could definitely add more, and/or some mozzarella too for extra cheesiness. The herbs are up to you – I went with thyme, but sage would go well with traditional stuffing/Thanksgiving flavors. Or you could make it a bit spicy and do paprika and chili powder. 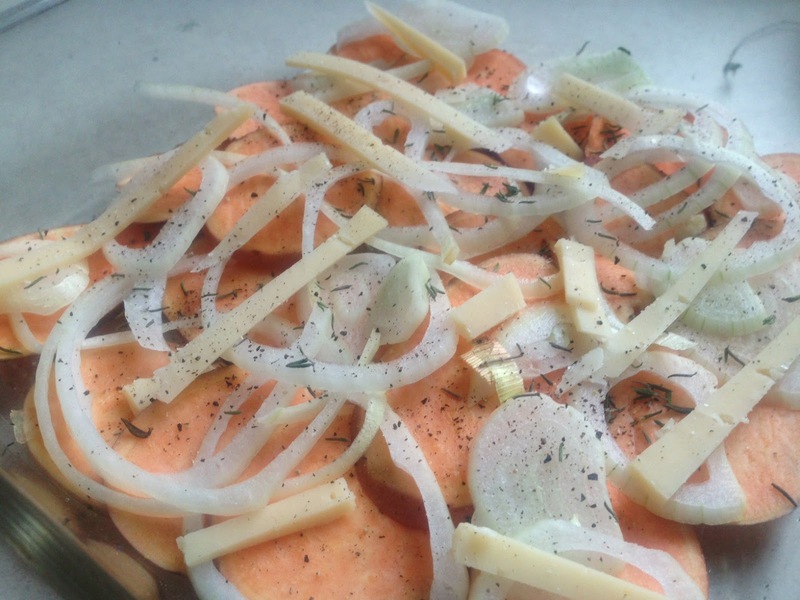 Build three layers in this order: potatoes (mixing sweet and regular), onion, grated cheese, herbs, salt and pepper. Evenly pour wine or broth over the top and cover with foil. Bake covered for 30 minutes. Remove foil and finish baking another 5-10 minutes or until top begins to brown and when you insert a knife in the middle the potatoes feel soft.